Any item that serves a dual purpose while Bikepacking is something that immediately saves you weight. 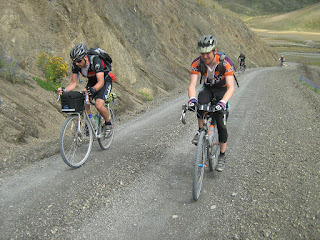 I always take two tire boots made from a piece of old road tire with the bead trimmed off, and although I've never had to use them myself, I have given two to different folks in two of the Kiwi Brevets I have done. I had heard that people use dental floss for mending tubular tires, because it is strong and comes pre-waxed. Mouth hygiene is important when doing long days on the bike, so, if you are already carrying dental floss, the only other thing you need to effect a temporary repair on a big gash in your side-wall is a needle. They don't weigh much, and a few Frankenstein stitches can stop the sidewall bowing out, which a boot wont do. I did the repair below and it seems to be holding up well. The white (rim) tape is stuck on with some F2, but in the field I reckon you could get away with just a tube patch to stop the dental floss thread rubbing on the tube, (assuming you are now using a tube!). You should then be able to ride into a town where you can buy a new tire. Looks pretty good to me even though I'd be tempted to use something stronger than floss. I've had lots of sidewall cuts over the years but never tried stitching them back up. I like the idea of using the sidewall from an old tire as a boot, makes a lot of sense. I'd have to make sure the area is airtight before reinflating - tubeless can be a pain. 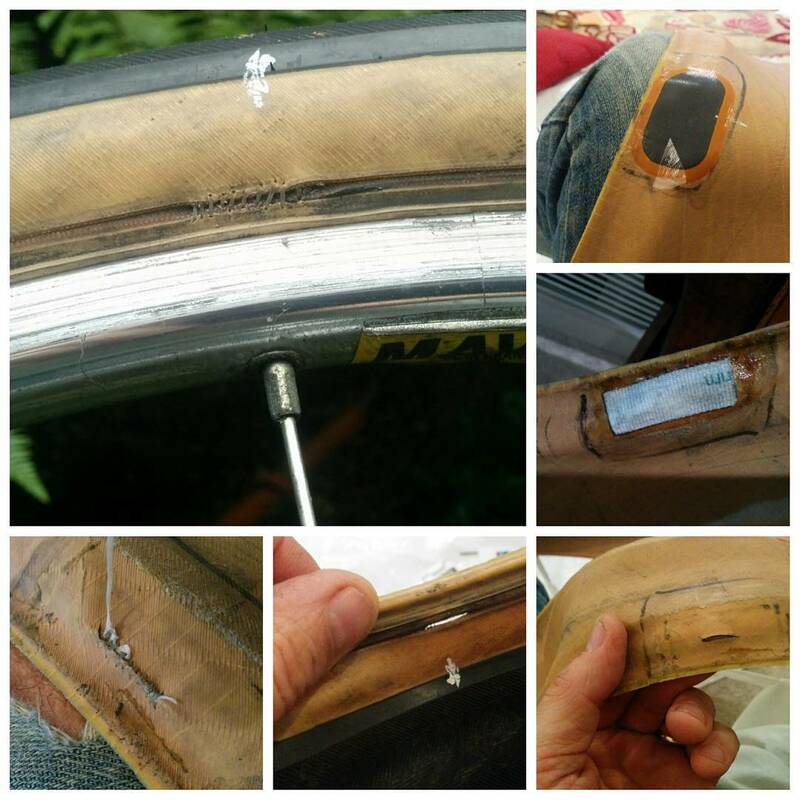 I've never had much luck gluing things to the inside of a tire (patches, a boot). I guess I might need to clean it better before I use the cement. You can't rough it up because the rubber is so thin. Tubeless sealant is especially bad, I'm thinking I'll take some alcohol wipes for this when I'm riding. Either that or just stick a tube in a wait till I get home to fix it... and waste $7 in precious sealant. I was wondering how a patch for a rubber boat (PVC or Hypalon) would work? They use excellent glue and the patches are built to take a lot of stress. Hmm, might work well.